Ray Joel has taken a classic magic trick from the magic set he had as a child and has made it into a more justifiable and entertaining performance piece. A spectator is asked to think of a number between 1 and 30. When he has one in his mind, the magician draws attention to his T-shirt. 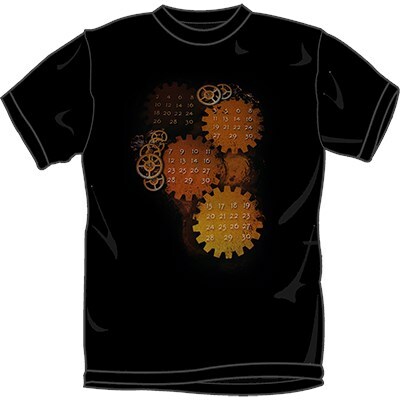 The shirt contains several cogs with numbers on them. The magician asks if the spectator sees his freely chosen number inside the wheels. The magician then concentrates and calls out a number. He's wrong; off by one. Maybe something went wrong, so he gives it another try. Another number is picked and the process is repeated. But again, the magician calls out a number which is off by one. For the climax the magician turns around and reveals he foresaw that he would always be off by one. The t-shirt can of course be used as 'proof' in any effect that uses the Off by One principle.